For all its apocalyptic fate-of-the-world theatrics, this...[adaptation of] the 2011 graphic novel Flashpoint by Geoff Johns and Andy Kubert...has an emotional core to give purpose to its crazy amounts of mayhem. 81 min. Warner Home Video. Director: Jay Oliva. Cast: Michael B. Jordan, Justin Chambers, C. Thomas Howell, Kevin Mckidd, Kevin Conroy (II), Nathan Fillion, Cary Elwes, Dana Delany, Danny Huston, Ron Perlman, Andrea Romano. What's great about Justice League: The Flashpoint Paradox is how it arrives at its culminative line of dialogue, from a Dark Knight to a Scarlet Speedster: "You're one hell of a messenger. Thank you." For all its apocalyptic fate-of-the-world theatrics, this DC Universe Animated Original Movie—adapted from the 2011 graphic novel Flashpoint by Geoff Johns and Andy Kubert—has an emotional core to give purpose to its crazy amounts of mayhem. Of course, DC's super-speed superhero the Flash was inspired by that oldest of superpowered messengers, the Greek god Hermes. 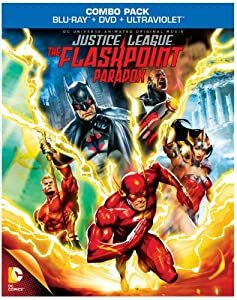 The Flashpoint Paradox kicks off with a Flash-featuring clash of titans between the Justice League and a cadre of supervillains (Captain Cold, Captain Boomerang, Heat Wave, Mirror Master, Top and, above all, Professor Zoom). What's present is prologue to what's past being prologue: when Barry Allen (Flash's civilian identity) awakens the next day, he discovers he's stuck in an alternate universe, one in which the world hangs in the balance of a war between Wonder Woman's Amazons and Aquaman's Atlanteans. What's worse: the Flash (Justin Chambers) has lost his superpower, and none of his one-time Justice League colleagues know him from Adam. Desperate, Barry heads to Wayne Manor to discover yet another shocking surprise: Batman (Kevin McKidd) ain't what he used to be (Kevin Conroy). With a lot of persistence and a bit of luck, Flash is able to enlist this world's Batman in a wildly risky plan to restore, today, Flash's superpowers and, tomorrow, the world. As usual, the superb DCU line seems to be leading the way for the DC brand in motion-picture media—in this case, making a case for the Flash. The 73-year-old hero seems to be having a moment: aside from The Flashpoint Paradox, the character will also feature in three episodes of the CW's Arrow series, the last of them a "backdoor pilot" for the Flash's own series (a privilege he last enjoyed in the 1990-91 television season). The possibility of a Flash film continues to percolate, as does an inevitable Justice League film to compete with Marvel's film-franchise centerpiece The Avengers. At any rate, Flash fans will love seeing their hero take center stage in this nifty "what if?" story, redolent of the kind of Elseworlds stories that first had their heyday in the Silver Age and are now a staple of the swelling DC catalog. Director Jay Olivia pumps up the action to staggering proportions here, but he tenaciously holds his grip on the parameters of the necessarily tightly packed 81-minute narrative. As always, the voice work impresses (even "it" boy Michael B. Jordan of Fruitvale Station pitches in, as Cyborg), and the colorful animation hurtles along with stylish verve. Warner's Blu-ray + DVD + Ultraviolet combo pack for Justice League: The Flashpoint Paradox proves a worthwhile investment for superhero fanatics. The picture quality is fairly consistent with earlier releases in this product line, which is to say blazingly colorful, appealingly eye-catching, and dotted with digital artifacts. Honestly, only eagle-eyed nitpickers will be bothered by these mild shimmering or pixelating or blooming byproducts of the animated source material, and DC fans who are videophiles have probably come to expect some small accumulation of aliasing, macroblocking, and banding in small doses. The overall impression is one of sharp detail and brilliant comic-book hues. As for the audio, now you'll be playing with power: the lossless DTS-HD Master Audio 5.1 surround mix never sacrifices dialogue but, by the same token, never misses a chance to rattle your cage with rumbling LFE, thunderous music and wraparound immersion. The feature-packed Blu-ray happily includes an informative Blu-exclusive commentary by writer Geoff Johns, producer James Tucker, screenwriter Jim Krieg & director Jay Oliva that will please DCU Animated junkies, along with a couple of cool featurettes. "A Flash in Time: Time Travel in the Flash Universe" (22:24, HD) again hands the reins to The Hero's Journey author Phil Cousineau, who this time puts the Flash and time-themed stories into mythic contexts. The Blu-exclusive "My Favorite Villains! The Flash Bad Guys" (18:58, HD) allows the filmmakers and DC staffers to wax enthusiastic about the Flash's rogues gallery. As always, we get supplementary DCU episodes "From the DC Comics Vault," this time all Flash-themed: from Batman: The Brave and the Bold “Requiem for a Scarlet Speedster!" (22:45, SD), from Justice League “Flash and Substance” (23:00, SD), and from Justice League Unlimited “Legends, Part 1” (21:57, HD) and “Legends, Part 2” (21:46, HD). Also included are a digital-comic excerpt from Flashpoint #1 (HD). HD trailers include Man of Steel, Lego Batman: The Movie, et al, but more importantly, we get "A Sneak Peek at Justice League: War" (8:10, HD) with Olivia, Johns, Jason O’Mara (Batman), Michelle Moynahan (Wonder Woman), Christopher Gorham (The Flash), Shemar Moore (Cyborg) and more. All site content © 2000-2019 Peter Canavese. Page generated at 04/17/2019 03:57:10PM.